car_brand_image - Who is the New Old BMW? Three to four decades ago BMW was a small, independent company making a very limited number of models, practically one design in three sizes, complemented by a very small production of coupes, substantially derived from sedans. From the business point of view it made sense and there was nothing particular there, with one exception: not just the coupes, but also the sedans were sporty, making them special in a world where sedans meant transportation and nothing more. That gave the BMW brand an edge over the competition. 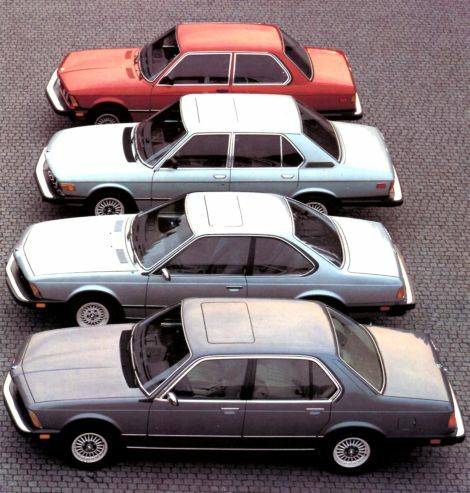 BMW didn’t invent, so-to-say, the sports sedan, that probably goes to Alfa Romeo, but, while Alfa Romeo’s image was declining, due to management problems in the late ’70s and early ’80s, BMW’s image was ascending fast, entering a segment where people are willing to pay a premium for their purchase. The rise was due to a combination of good quality and performance, clever marketing and, in US, a strong demand for economical cars after the two oil crises of the mid ‘70s. The BMWs of that era were typical European vehicles: simple, light, nimble and quick. On top of that, they were providing first class engineering, quality and especially unmatched driving experience. Over the years, the BMW brand and products evolved significantly. 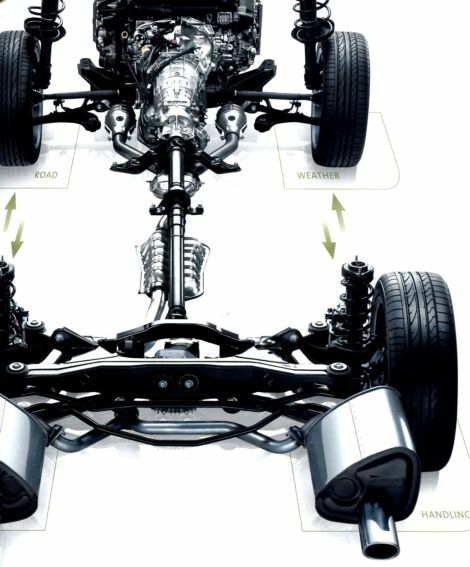 The company is still famous for its innovative engineering, quality and driving experience. Production volume increased, currently at over 1 million units a year, and the segments covered are more numerous, with some models creating actually their own niches. More importantly, the vehicles are substantially bigger, heavier and more complex. BMW today is a different company than the one it was 3-4 decades ago. The question arising would be: what brand, if any, moved or is ready to move in this place vacated by BMW going upscale or, who is the new old BMW? This segment, characterized by simple, light, quick and appealing designs offering driving excitement, is still sought after by consumers, especially car enthusiasts, and it’s a potential launch pad for any brand as it was for BMW. The first name coming to my mind is the mid ‘80s Honda. Looking at the entire model lineup, not just the Prelude and the CRX were sporty, but the Civic and the Accord too. They were all above their competition in performance, driving experience, and also design. It seemed that Honda was to replace BMW, as the Germans were moving up, and distance itself from Toyota and Nissan. Honda, in the mid ‘80s, did a tremendous job. The Civic proved that a small car, an econobox normally called in the US, can be more than that, it can bring excitement in driving and ownership. The driver is a proud owner, the opposite of the image “this is all I can afford”. I remember that a lot of my friends wanted to buy a CRX and many, later, did and enjoyed it. In the late ‘80s, Acura brand was launched to compete head on with BMW. After a good start, Acura lost its direction and, at the same time, Honda dropped the performance and excitement characters from its vehicles, with the exception of the Civic which lived a decade of glory as a pocket rocket until the infamous 2001 model came out and ended up all the zing this brand still offered. Honda extinguished any remaining hope of being a different brand, offering from that point on middle of the road transportation for the large masses, characterized by good quality and reliability but lacking excitement, exception the S2000. It looks like Honda, after 1990, couldn’t create a clear image of itself and struggled in deciding what both, Honda and Acura brands, were standing for. Designs looked more like the result of a momentary reaction then that of a strong and coherent, long term strategy. Four years ago I was in Las Vegas and one evening, after spending the whole day at the SEMA show, I went with two of my friends to have dinner. During the conversation, certainly talking about cars, the subject turn to Subaru, and one of my friends said that he sees Subaru today (N.B. 2006) where BMW was two or three decades ago. I was surprised by his affirmation because, more or less, I had the same opinion. Subaru is one of my favorite brands. The company is small, the quiet underdog which concentrates on quality products, promoting its excellence in engineering, opposite to some of the large corporations out there always talking about how many millions of vehicles they will produce within the next few years. Subaru, in US, has a good model lineup, a small and a medium size car, complemented by a small and medium size CUV and soon a sports coupe. A simple lineup and a small production number, just under half million units in 2009. Same as BMW in the ‘70s keeping the RWD configuration for all their vehicles, when most everybody was going FWD, Subaru uses its peculiar flat engine and AWD. It’s a configuration which makes its vehicles more competitive, even if more expensive. It also makes the brand stand out, and overall, shows that Subaru stands for its design and is very confident of it. And, like BMW, with models like the WRX STI and the performance in competitions around the globe, Subaru demonstrates that it is a leader in its field. In 2005 Subaru seemed to make the step, like BMW years before, to the premium luxury segment. The first model coming out under such a strategy was the Tribeca, an interesting vehicle, except for a very odd, unfortunate styling. Today, after signing a partial partnership with Toyota in 2005, Subaru’s brand image is becoming a little blurry, due to the sharing of some products that are not following the concept Subaru stands for. While these rebadged vehicles are not sold in the US, is this a sign that Subaru, like Honda in the early ‘90s, walks away from its core competency and embraces the “bigger (production numbers) is better” mentality? The situation for both, Honda and Subaru, is about focus when managing a brand. Marty Neumeier, in one of my favorite books about brands, says “…focus is difficult to achieve because it means giving something up. It runs counter to our most basic marketing instinct: If we narrow our offering, won’t we will narrow our opportunities for profit? Answer: Not necessarily. It’s often better to be number one in a small category than to be number three in a large one. At number three your strategy may have to include a low price, whereas at number one you can charge a premium. History has shown that it pays handsomely to be number one in your category – first, because of higher margins, and second, because the risk of commoditization is almost non existent”. Could it be that BMW moved already to the aforementioned vacant place with a brand of its own, Mini? Having its own experience, BMW is for sure an expert in how to play this card correctly. The success of the mini brand is a proof of it. I’m sure there is a lot of room for interpretation here and, as boundaries between segments in the automotive market have blurred and overlapped, and the conditions in the current market are very different than the ones 30 to 40 years ago, we can’t have a direct comparison and a precise answer to the title question. The most important is the fact that we can look back at history, using a good eye and a good sense, and learn about strategies that will help us create new ones offering our company a superior competitive level. The key is knowing how to translate them to today’s market conditions, to stay away from the “business as usual” mentality, and to have a gut feel. Nice blog, it’s important to comprehend the shift in priorities over time which keep the products relevant to the time and place aspects of the market. I think BMW has stayed progressive, with the EfficientDynamics program. 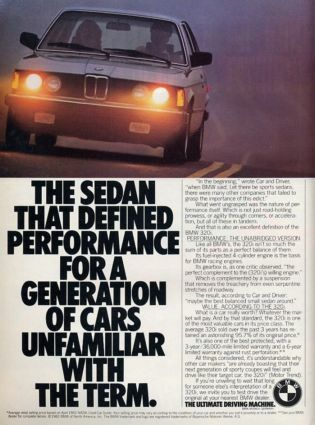 As a student of branding and as a former BMW 325 owner (1991 model, when it still looked like, and performed like, a BMW), I enjoyed this insightful and entertaining blog. BMW lost its way, diluting its brand. It’s interesting to see how it tries to reclaim some of its former distinctiveness in its commercials on AMC’s Mad Men. Sorry, BMW – but you’ve lsot your way, and there’s no GPS device for brands that take a wrong turn. Dan, thanks for your comment. I consider BMW today a very well developed brand which followed cleverly the evolution of its market. When the market is a moving target, certainly no company can afford to stay the same. BMW can be praised for the fact that they stayed the course being themselves for many decades and never tried to be like an other company. They have to innovate constantly to stay ahead of a competition trying to be like them. In creating new models in new niches (which might seem as dilution of its brand), I believe they successfully avoided the case, well known in the automotive industry, of being everything to everybody. All that perhaps brought BMW to a new level and they are very well aware of that. Rover, many years ago, and Mini are reactions to these changes. You are currently reading Who is the New Old BMW? at car_brand_image.